The "S.sensing™" water treatment chemical management service is provided globally by Kurita Water Industries Ltd., a company that works with facilities and chemicals regarding industrial water treatment. 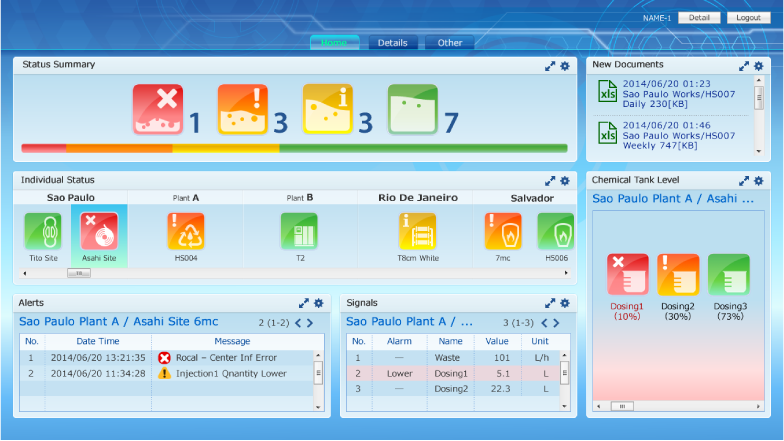 This service automatically controls the water treatment efficiency and the concentration of chemicals in water treatment facilities using unique sensors. 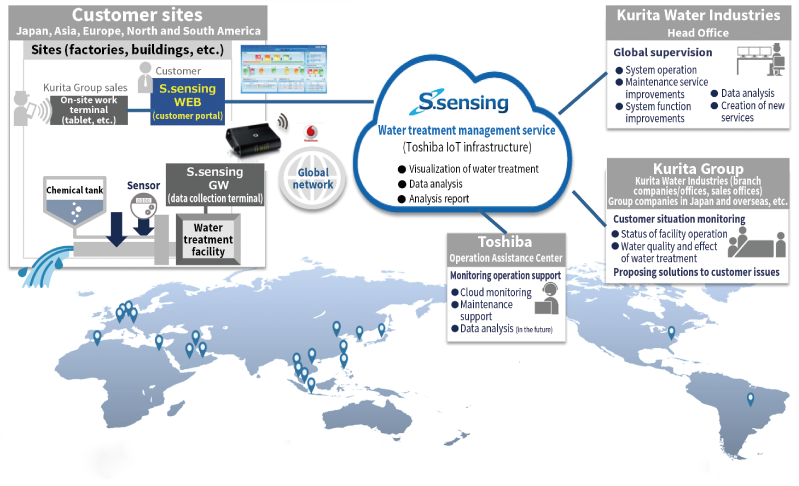 Toshiba Industrial ICT Solutions Company (hereinafter "Toshiba") has constructed a water treatment remote monitoring service system for providing information via the "S.sensing WEB" portal site for sharing information gathered from the sensing devices used for S.sensing. Various issues became apparent regarding the water treatment remote monitoring that the company had been involved in since the 1990s, such as increased difficulty obtaining replacement parts and the expiration of server maintenance contracts. The company decided to build a remote monitoring system in order to provide new added value to customers, as well as assist expansion to overseas markets. The "S.sensing WEB" portal site for sharing information with customers was constructed to enable intuitive and easy-to-understand sharing of information thanks to a design based on the UXD methodology of Toshiba. The company succeeded in building IoT infrastructure for a global water treatment chemical management service while keeping costs down. Kurita Water Industries Ltd. is a leading company in the field of industrial water treatment that is expanding globally based on its corporate philosophy of "Study the properties of water, master them, and we will create an environment in which nature and man are in harmony." The company focuses on three fields of business; water treatment chemicals used in products such as boilers and cooling water, water treatment facilities such as waste water reclamation and industrial water treatment, and the maintenance and service of those two businesses. In order to achieve its vision of "A creator of unique value to the solution of water and environment, contributing to the realization of a sustainable society," the company pursues new functions and new value for water. Kurita Group companies and subsidiaries now number 27 companies in Japan and 20 companies overseas. By March 2016, group sales had exceeded 200 billion yen. The company is a pioneer in the field of remote monitoring for injecting the appropriate chemicals at customer water treatment facilities based on sensing data. With a history of more than 20 years of doing so, various issues became apparent during the process, such as increased difficulty obtaining replacement parts and server maintenance contracts expiring, and that is why the company decided to build a remote monitoring system in order to provide new added value to customers. Up until now, Kurita has worked on extending its "TELESENTRY" remote monitoring system constructed in the 1990s as required, while also promoting global expansion in its own way, such as the construction of its new "Kurita IT System" in 2005. The company started investigation into the creation of a new system based upon the idea that it is necessary to provide further added value in order to expand its business. 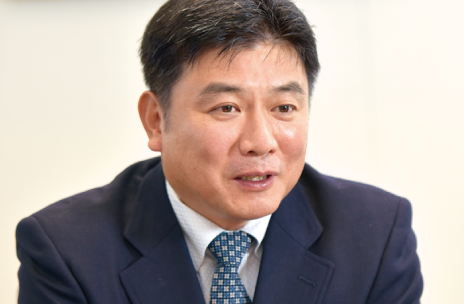 Mr. Kuniyuki Takahashi, Leader of the Infrastructure Technologies Group at the Research and Development Division, reflects on this time, saying "Not only was it becoming difficult to procure replacement parts for devices that collect information from sensing devices, but we were also facing limitations regarding the handling of our systems and the amount of data that could be sensed. We came to the conclusion that with future global expansion in mind, we would need to develop a new system that we can roll out with standard specifications." 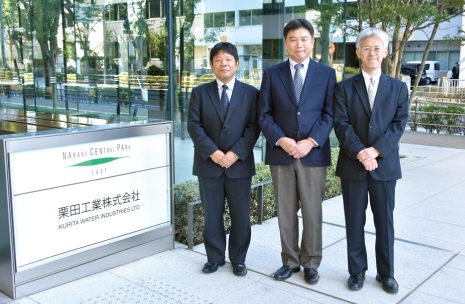 Kurita defined an expanded presence in overseas markets and strengthened position in Japan as goals of its "Competitive Kurita 2017 (CK-17)" medium-term management plan started in April 2015. Masanobu Osawa, Head of the Device Section at the Technology Supervisory Department of the Chemical Business Division, gives the following description. "In order to aim for a corporate structure based in the four regions of Japan, Asia, Europe, and North and South America, we needed to build a sales system and information and network services that consider expansion to overseas markets. That was in our minds as we started system renewal." Furthermore, Kurita's existing services used faxes as their main communication tool, and there was no system for sharing visual information with customers. According to Kaname Harada, Leader of the RO/Sensing Promotion Team at the same department, "We needed an environment that enables us to immediately access and share the information we require, but up until that time, we spent a large amount of time having specialist technicians configuring device settings. In order to speed up our global expansion, we wanted a new system that could be used by people who were not necessarily experts." The proposal covered on-site data collection terminals, the construction of a portal site providing information to customers and in-company sales representatives, and a general system overhaul including global network infrastructure. Requirements from the Development Department included being able to reach the required information with a single click, having a system that can be expanded to support a diverse range of devices, and clearing security requirements for communication and servers. 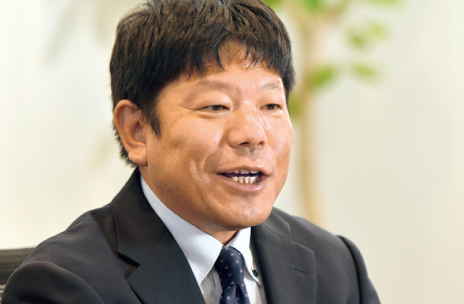 When Kurita requested a proposal from multiple companies, their attention fell on Toshiba. "When we asked for the opinions of not only the Development Department but other related departments such as the Operations Division and Information Systems Division, they unanimously chose Toshiba's proposal. Toshiba fully understood what we wanted to achieve and included it in their proposal," explains Mr. Takahashi. "What we particularly lacked up until now was a good design," recalls Mr. Harada of the Operations Division, which actually deploys solutions to customers. "Toshiba has a department that specializes in design and since they have rich experience designing from the user's perspective with their consumer electronics, I thought that they would be able to utilize that expertise in our system. Other companies proposed the use of BI tools to show information, but their proposals did not include a specific interface." Toshiba has a wide range of experience with remote monitoring systems, and its knowledge and technical ability contributed to its sense of reliability. Another key point that led to the selection of Toshiba was their consideration of running costs. Since the amount and number of items of data would dramatically increase compared to the previous system, it was important to see whether the new system would be able to operate at a similar cost to before. 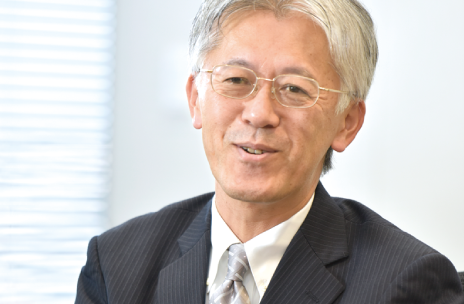 "Toshiba went through the proposal with Vodafone Global Enterprise in advance, and proposed optimized costs for the system, including a global network," explains Mr. Takahashi. Kurita was also pleased with the fact that the data collection terminals included in the proposal were generic devices, rather than dedicated ones. "We want to avoid incurring high costs several years in the future due to difficulty in procuring parts to handle device degradation. It was very nice that Toshiba gave us a proposal that covered the entire system from our point of view, including simple setup of terminals," says Mr. Harada. 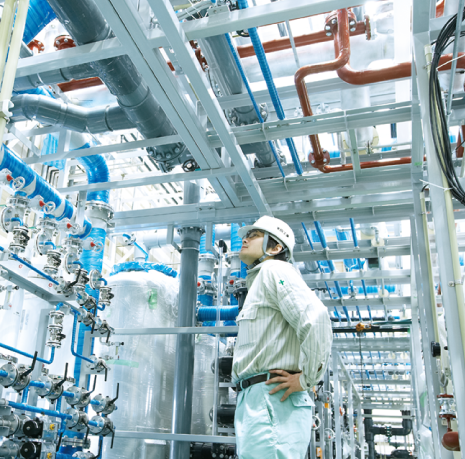 This was how a remote monitoring system from Toshiba came to be adopted in the "S.sensing" water treatment chemical management service of Kurita. Information can now be aggregated and displayed in "S.sensing WEB," which was constructed as a portal for sharing information with customers, via S.sensing GW newly installed from S.sensing devices. In addition to data such as the operation information of S.sensing devices, image data can now be collected, and the amount of data handled has increased more than 50 times. This information can be displayed on tablets and computers. In addition, a linking function enables the centralized management of data such as analysis information, water quality measurement information, and safety data sheets, and comprehensive water quality reports can be output. Reports for customers can be automatically generated on a daily or monthly basis, and required information on water quality trends, etc. can be immediately accessed. "S.sensing WEB" also provides opportunities for communication with the customer. The service has been deployed mainly in Japan from July 2016, and is starting to also be adopted overseas. Although the previous "Kurita IT System" was highly customized by site, the new standardized system makes it easier to perform on-site installation, and this work can be outsourced. In regard to installation time, "What previously took more than half a day can now be completed in a mere 40 minutes or so," says Mr. Harada. Furthermore, the system has the expandability required to support unique customer sites. "The content of the boilers, etc. that contain chemicals is constantly fluctuating, and customers often say that they would like to also be able to view information such as operation rates. 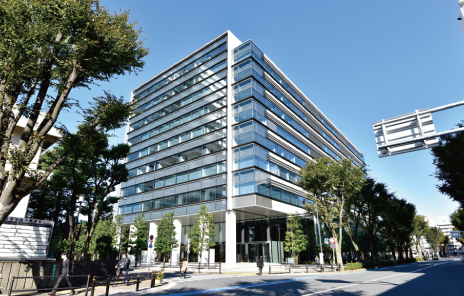 Being able to provide new added value will surely lead to new business opportunities that we did not initially expect, such as being able to provide information to assist design optimization when updating facilities," explains Mr. Osawa. The new system is well regarded at information sessions held for dealers and sales companies. "They say that it is easier to use now that the system can be viewed not only from computers, but also from tablets and smartphones," says Mr. Osawa. Mr. Harada also has a high opinion of the design utilizing Toshiba's UXD methodology, stating "Our customers say how much they like its appearance. Our sales representatives are also highly satisfied, saying how our customers appreciate how well-finished the design is." Although there are regional differences in design preferences, it is also well regarded at the global level. "It is designed to allow us to change the icons, and Toshiba also worked on configuration templates. We are satisfied overall," says Mr. Takahashi. In regard to how Toshiba handled the project, Mr. Takahashi also says "Although some areas took longer than expected, such as verifying data collection from sensing devices and linking with core systems, Toshiba smoothly worked together with its internal departments and coordinated with Vodafone. They also provided one-stop support for solving problems as one would expect of Toshiba." Looking ahead to the future, Kurita is promoting the replacement of the 4,000 existing TELESENTRY systems with S.sensing® devices by around March 2018, and although the schedule is not yet determined, the company also plans to progressively roll out the new devices to all of the 30 countries and approximately 10,000 sites where it conducts business over the world. The company also wants to increase the ease of using S.sensing® WEB as a portal for sharing information with customers and a place for exchanging various types of information. As Mr. Harada explains, "We want to further enhance the information collected and become able to provide new value in combination with our knowledge on water treatment. In order to do so, we want to receive proposals utilizing the big data analysis and AI technology of Toshiba, and we plan to make such requests." Mr. Takahashi also emphasizes that the company wants to work on mechanisms for providing further added value to sensing information, such as by strengthening functions for analyzing collected data and customer KPI measurement, stating "I want our customers to think that the reason they chose Kurita is because they can obtain various types of information that others cannot provide." "Sales of water-related chemicals is a continuous business, which has strong contact points with customers. Our company has a policy of utilizing information technology to further strengthen those contact points. I would like us to take our current measurement and monitoring business one step further to work on optimizing water around the world, and I hope that we can build a global standard to do so while continuing to collaborate with Toshiba," says a passionate Mr. Osawa. Toshiba will surely continue to support the world's water together with Kurita Water Industries. *The content of this article is based on information from November 4, 2016. *Numeric data, organization names, and positions, etc. are current at the time of writing. *"S.sensing" is a registered trademark of Kurita Water Industries Ltd in more than 30 countries .